FBI files on writers with dangerous ideas, including Hannah Arendt, Allen Ginsberg, Ernest Hemingway, Susan Sontag, and James Baldwin. Writers are dangerous. They have ideas. The proclivity of writers for ideas drove the FBI to investigate many of them--to watch them, follow them, start files on them. 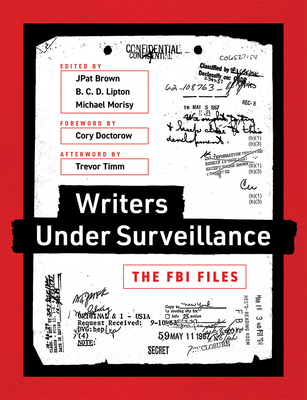 Writers under Surveillance gathers some of these files, giving readers a surveillance-state perspective on writers including Hannah Arendt, Allen Ginsberg, Ernest Hemingway, Susan Sontag, and Hunter S. Thompson. Obtained with Freedom of Information Act requests by MuckRock, a nonprofit dedicated to freeing American history from the locked filing cabinets of government agencies, the files on these authors are surprisingly wide ranging; the investigations were as broad and varied as the authors' own works. James Baldwin, for example, was so openly antagonistic to the state's security apparatus that investigators followed his every move. Ray Bradbury, on the other hand, was likely unaware that the Bureau had any interest in his work. (Bradbury was a target because an informant warned that science fiction was a Soviet plot to weaken American resolve.) Ernest Hemingway, true to form, drunkenly called the FBI Nazis and sissies. The files have been edited for length and clarity, but beyond that everything in the book is pulled directly from investigatory files. Some investigations lasted for years, others just a few days. Some are thrilling narratives. Others never really go anywhere. Some are funny, others quite harrowing. Despite the federal government's periodic admission of past wrongdoing, investigations like these will probably continue to happen. Like all that seems best forgotten, the Bureau's investigation of writers should be remembered. We owe it to ourselves.